Map showing the boundaries of the City of Santa Clarita as originally proposed at 90 square miles (Jan. 2, 1986 version). Signatures were gathered from residents within this area to initiate the process of incorporating this area as a city. As a result of subsequent hearings in 1986 and early 1987, Los Angeles County's Local Agency Formation Commission (LAFCO) scaled back the proposal to 39.5 square miles, removing areas west of Interstate 5, north of today's Copper Hill Drive, and east of State Route 14 (but leaving in the developed parts of Sand Canyon). Forming a new city required the consent of the governed, and in the case of built communities, that meant a vote of the residents. In the case of large swaths of raw, buildable land, LAFCO honored the wishes of the landowners. The developers of planned subdivisions that did not yet exist — Stevenson Ranch, Valencia-Westridge, Tesoro Del Valle, Fair Oaks Ranch and others in between — opted out. Interstate 5 formed a natural boundary, and with no more land mass to connect to Castaic, LAFCO deleted Castaic from the map — even though Castaic residents were among the earliest and most vocal cityhood proponents. The result was essentially a line drawn around the built communities of Newhall, Saugus, Canyon County and Valencia. (Most parts of all four were included, but portions of each were excluded.) Residents within the final boundaries as set by LAFCO voted to incorporate as a city on Nov. 3, 1987 (69 percent voting yes, 31 percent voting no). Simultaneously, the voters elected their first 5-member City Council and opted for their representatives to be elected at-large (instead of by council district). Incorporation occurred Dec. 15, 1987. 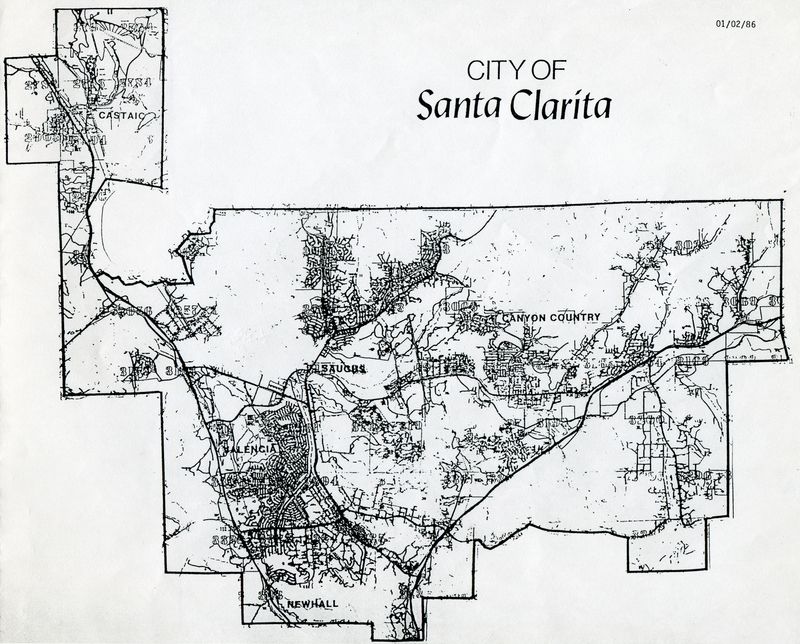 As new subdivisions have been developed in subsequent years, their residents have opted to join (annex into) the city, which has grown to encompass 57.9 square miles and 209,130 people as of May 1, 2014 &dash; making Santa Clarita the third largest city in Los Angeles County after Los Angeles and Long Beach. LW8602: 19200 dpi jpeg from photocopy in files of Connie Worden-Roberts.